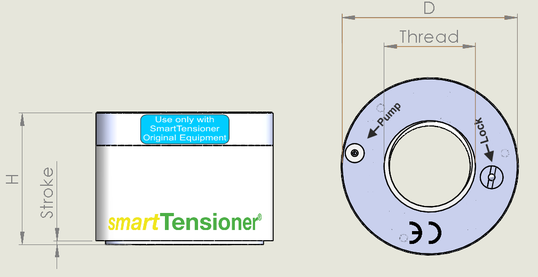 smartTensioner HMTU is used instead of a conventional hexagon nut. Multiple HMTUs are often mounted on a multi-stud flange connection. All HMTUs are synchronously pressurized using the smartTensioner HydraulicPump HP. Each HMTU is supplied by its own HP. The very high hydraulic pressure (up to 300 MPa) moves an annular piston against the flange and leads to a defined elongation of the bolt. After reaching the targeted pressure, the bolt elongation is secured permanently by turning the HMTU lock. The hydraulic pressure is released. smartTensioner HMTU locks the bolt force with several locking bolts within the HMTU. This design allows more piston space and higher bolt forces with smaller diameters as other solutions. The unit is fully serviceable from above – difficult access from the side is not necessary. Very high remaining bolt force due to low setting losses of less than 15%. Completely new locking mechanism. Bolts distributed on the pitch diameter lock the piston movement after pressure release. Very efficient force flow inside the HMTU and more shear space of the locking screws compared to other solutions. Easy locking mechanism with defined torque. No puller bars required! 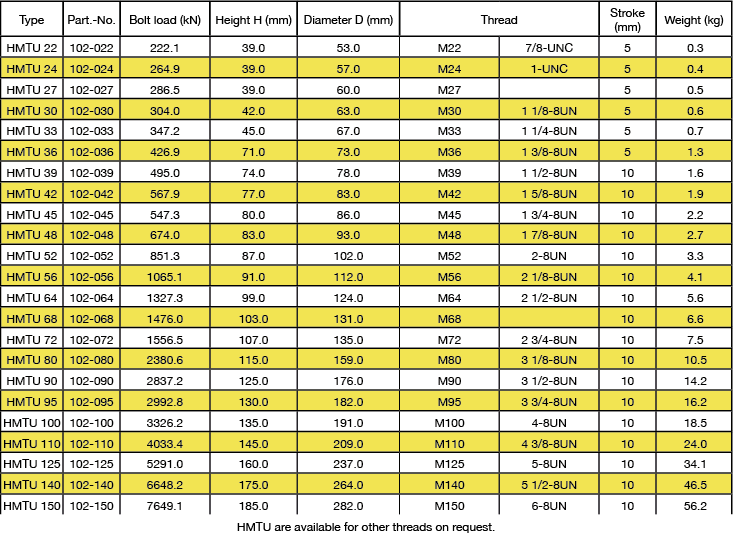 Very high tensioning force despite small diameter. Perfect for highly loaded flanges. 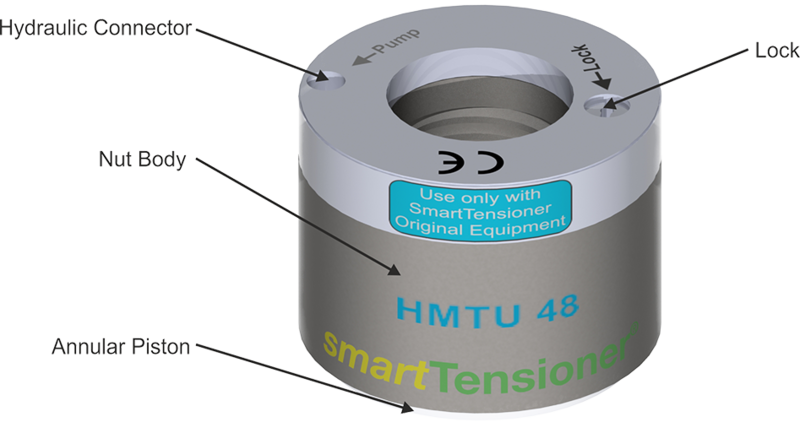 What are the smartTensioner HMTU innovations? 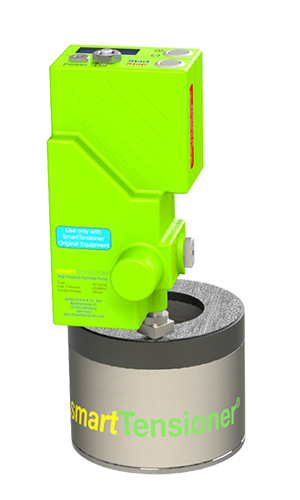 HMTUs operate with high pressure, allowing small cylinder diameters. The force/diameter ratio is unique on the market. It allows design engineers to use more capable materials for their bolts. Flange parts can be pressed together with more pressure, improving overall tightness. The setting loss of smartTensioner HMTUs is less than 15%, independent of the load. Other products on the market that use different mechanical locking systems suffer from setting losses of up to 60%. Normally, setting losses occur in all tensioning systems that use hydraulics to stress bolts and use mechanics to ensure the bolt stress: the bolt force after hydraulic prestressing is higher than the remaining force after mechanical locking. The reason for this is the change of force flow within the hydraulic nut. Our HMTU uses several locking bolts to lock the annular piston (patents pending). These bolts are very precisely machined and move against the annular piston by fine-threaded screws. The height of the locking bolts and screws is as low as possible to avoid any losses in stress due to the straining of the bolt and screw. Moreover, the change of the force flow within the nut body has been optimized by comprehensive FEA analyses to minimize setting losses. The mechanical locking in the HMTUs consists of bolts and fine-threaded screws. The cross-section area of these bolts and screws as well as the total shear area of the screws is ultimately the most important part of the HMTU since it withstands the load over infinite time. Compared to other solutions on the market that use for example a ring nut around the annular piston, the bolts and screws of the HMTU offer a greater pressure area and a greater shear area. The parts that withstand the applying loads are fully within the nut body. The widening of loaded threads that might occur with thin rings around the annular piston is broadly excluded.